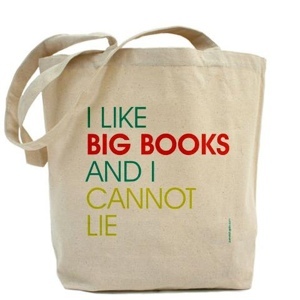 I like bags. And if they’re cute and clever and good for the environment, then so much the better, I say. And I’ve found these very cool canvas shopping totes on etsy, made by Pamela Fugate Designs, and I reckon they fit the bill. 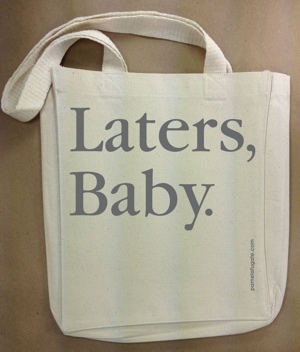 Or this, for fans of Fifty Shades of Grey. Yep, really. 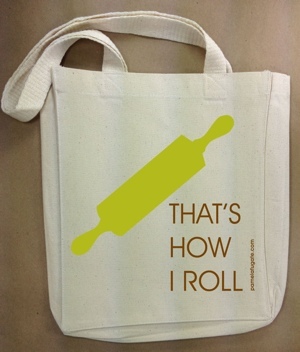 And for the bakin’ homeboy or homegirl in your life, there’s this bag. 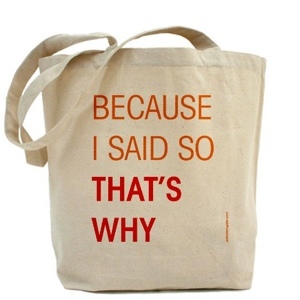 There’s this classic Mom/Mum bag, which I’m guessing is meant to stop any pesky children asking too many questions. But I wouldn’t recommend bringing it along to your local farmer’s market as it feels in conflict with the relaxed, organic, herbal kinda vibe. Unless of course you are the organic farmer selling your produce. In which case, you might want to sell these bags in answer to questions like, “Why does that organic clove of garlic cost $32?” or “How do you know that heirloom tomatoes are worth 500% more than regular tomatoes?” or that sort of thing. There’s also a range of customised wedding totes – I’m not really sure how they work though, to be honest. As a bridesmaid, I’ve never received a show bag of treats from the bride (not complaining, I have been lucky to receive much nicer gifts from the lovely brides I’ve maided for). And I’ve not been to a wedding that gave away a goodie bag instead of a small memento that you could take home in your handbag. But each to their own on their big day! You can check out the range of bags (and shirts and baby outfits) at Pamela’s etsy shop here.